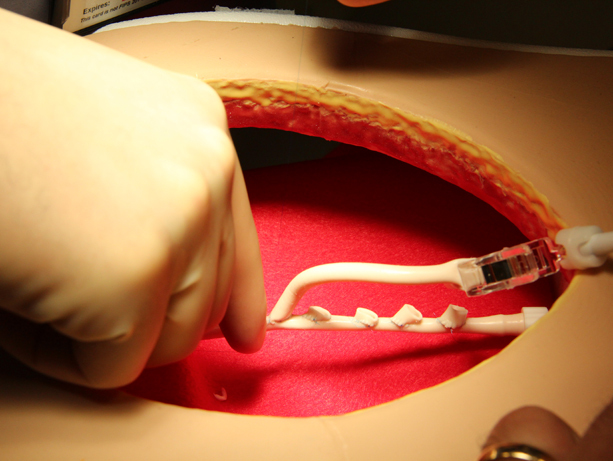 Such on-the-job training has been standard forever, but a study published today in The Annals of Thoracic Surgery indicates there might be a better way: simulation. “Conventional thinking is that the only place you can learn cardiac surgery skills is in the OR. We found that’s not true,” said UW Medicine cardiothoracic surgeon Nahush Mokadam. He and peers at seven U.S. academic medical centers developed a simulation curriculum and evaluated its benefits to surgical residents. At the end of the study, the simulation curriculum was reworked into 29 sessions, rather than 39. The coursework is available via the Thoracic Surgery Directors Association. Members of the Cardiac Surgery Simulation Consortium also can train faculty members at other residency programs on how to use the curriculum. Over a span of months, with repeated practice and coaching from faculty mentors, 27 novice-level residents became “expertly skilled,” Mokadam said, in routine procedures such as aortic valve replacement. Residents received detailed instruction in how to address catastrophes during surgery, and then practiced in a fully immersive simulated environment. “Practicing surgery outside of the high-stakes, real-patient environment better prepares the trainee. When they get to the operating room, it’s not the first time they’ve practiced or conceptually gone through the steps of a procedure,” Mokadam said. The study involved a rigorous, 39-session (four hours/week) course with training modules for three common cardiothoracic surgeries and three adverse events. Simulation technologies ranged from low-fidelity plastic models to real tissue and pig hearts that paralleled the experience of surgery on actual patients. Cardiothoracic surgery residents improved in all technical skills evaluated, with perfect or near-perfect performance after about 110 hours of simulation training per resident, the authors said. The course also significantly improved trainees’ decisions and communications. A surgeon practices coronary artery bypass grafting on a pig heart at the WWAMI Institute for Simulation in Healthcare. picture of a surgeon performing coronary artery bypass grafting on a pig heart at the WWAMI Institute for Simulation in Healthcare. The study’s lead investigator, Dr. Richard Feins of the University of North Carolina, said the modern operating room is too fast-paced and has too many competing priorities to be the only place to train residents. The value of the course was also evident in participants’ feedback, gathered in a survey: Among respondents, 85 percent of residents and 100 percent of faculty felt more comfortable with the residents’ OR performance. Dr. Josh Hermsen, now a UW Medicine attending cardiothoracic surgeon, was among the residents who took the course at the WWAMI Institute for Simulation in Healthcare. He said the course’s biggest advantage was its low-risk, low-intensity environment, which encouraged the exploration of concepts and gave time for lessons to sink in. “From the get-go, I felt like I had a framework to think about the cases we were doing,” Hermsen said. “What we were doing in the OR made a lot more sense. One big plus was learning the nuts and bolts of the heart-lung machine, which looks like a bunch of tubes going every which way; it can be confusing and even distracting in surgery. UW Medicine cardiothoracic surgeons Nahush Mokadam, left, and Josh Hermson. pictures of UW Medicine cardiothoracic surgeons Nahush Mokadam and Josh Hermsen. Such validation supports the efficacy of simulation training, Mokadam said, even though the participant-focused results cannot be scientifically said to improve patient care. In addition to Drs. Fein and Mokadam, the Cardiac Surgery Simulation Consortium includes Drs. Harold Burkhart of the Mayo Clinic; John Conte of Johns Hopkins University; James Fann of Stanford University; George Hicks of the University of Rochester; Jonathan Nesbitt of Vanderbilt University; and Robert Shen of the Mayo Clinic; and Jennifer Walker of Massachusetts General Hospital.